With prior notification, it is possible to obtain entry to the institute’s complex. Therefore, please contact us beforehand. For detailed directions click Route on the above listed map. 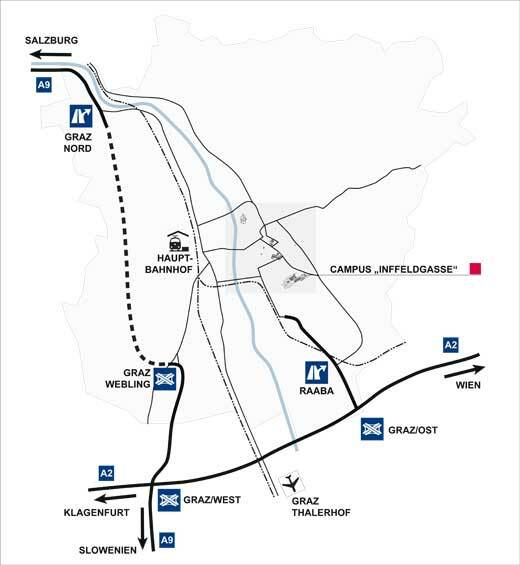 If you arrive by train, take tram line 6 (towards St. Peter) and get off at Schulzentrum St. Peter. After arriving there turn right into road Inffeldgasse and walk for 300m. Move to the left and follow the street's course until you reach a violet building. You can find us on the second floor. If you arrive by train, take tram line 1 (towards Mariatrost) or tram line 7 (towards St. Leonhard LKH) and get off at Jakominiplatz. At Jakominiplatz take tram line 26 (towards St. Peter) and get off at Schulzentrum St. Peter. After arriving there turn right into road Inffeldgasse and walk for 300m. Move to the left and follow the street's course until you reach a violet building. You can find us on the second floor. If you arrive at Graz Thalerhof Airport we recommend taking a taxi. It usually costs around €20 and will take about 25 minutes to get to Inffeldgasse. With prior notification it is possible to obtain entry to directly drive to Infeldgasse 21b. Arrive at the corner of Petersgasse and Inffeldgasse (Schulzentrum St. Peter) if you did not notify us beforehand and walk for 300m. Move to the left and follow the street's course until you reach a violet building. You can find us on the second floor.